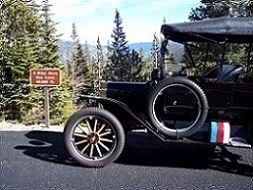 Saw this picture on ebay today, Center Door model year 1917 or 1918 I think. I note that the door handle is black coated with nickel plated washer. If you still have the link to the e-bay auction would you please send and/or post it? That has a lot of details I would like to possibly snag. 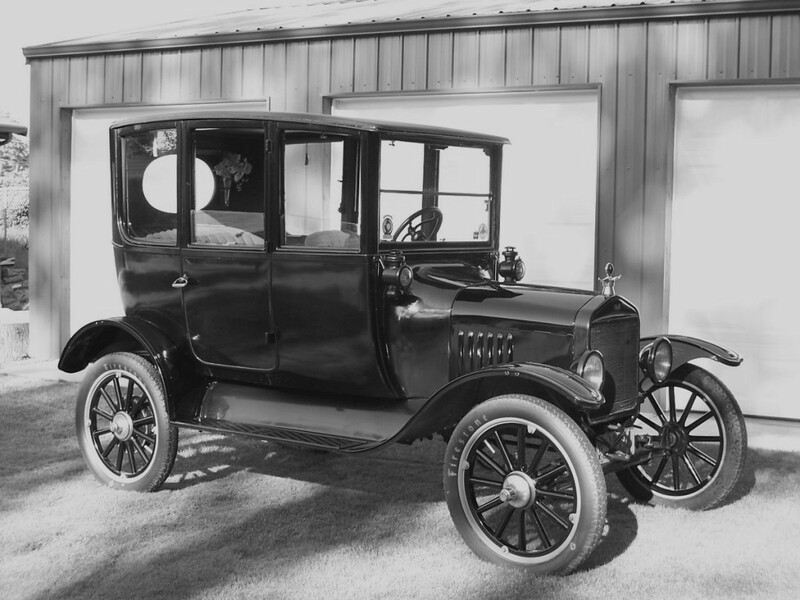 In Bruce�s book he has several early photos of the 1915 Centerdoors and the 1919 and later Centerdoors with the electric starting and demountable rims. 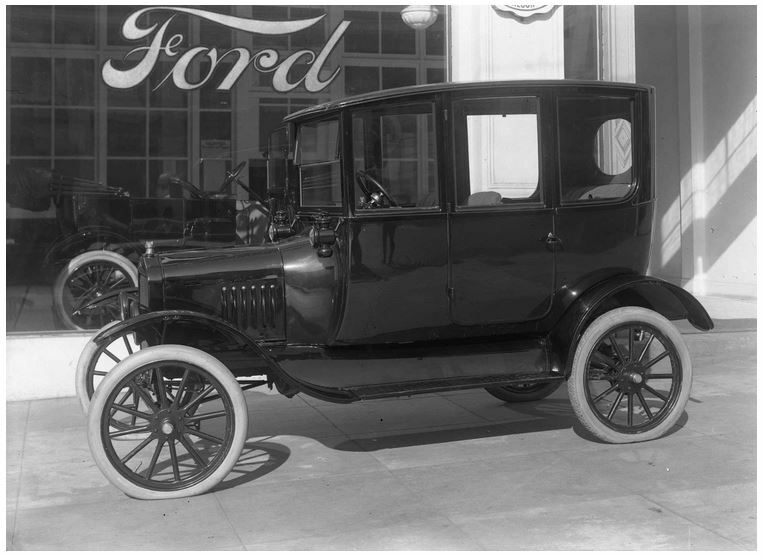 But when I just looked, I did not see one (I could have missed it) of the 1917-1918 with the cowl lamps and non-demountable wheels. That would place the photo take after Apr 19, 1917. Depending on when I look at the photo I believe I see the bulge / stamping at the rear of the splash apron and other times I think it is just the reflection of the rear fender in the shiny new paint of the body. Of course I�ve seen other things that turned out to be what I wanted to see rather than what was really there. So if others see or do not see that bulge in the splash apron � feel free to chime in. What bulge? Please see: http://www.mtfca.com/discus/messages/118802/140336.html?1273603724 for additional details. New splash aprons (T-7986, 7987) eliminating clearance stamping at rear. "Perfectly plain from front to rear." Steering column shafts milled for one key instead of two at the steering wheel. Even if the splash apron does have the bulge, Ford would have normally used up the old style splash aprons. But �IF� it has the bulge, I believe that would put the Centerdoor in the Apr 1917 to late 1917 time frame. And of course the Centerdoor may have been a slow seller and sat at the dealership for a while. I don't see the bulge in the splash aprons, it is very pronounced and easy to see if it were there. 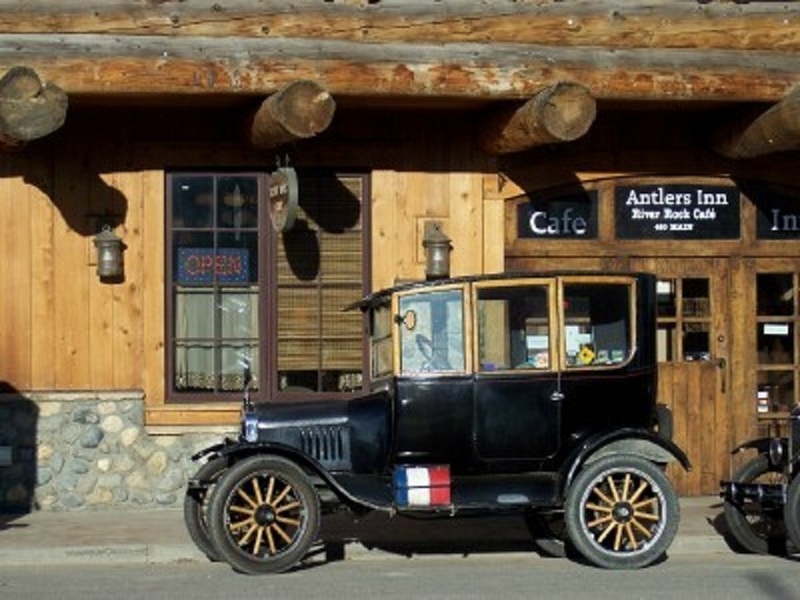 This can only be a 1918 model year car. ... you're right in 1918 is probably right. 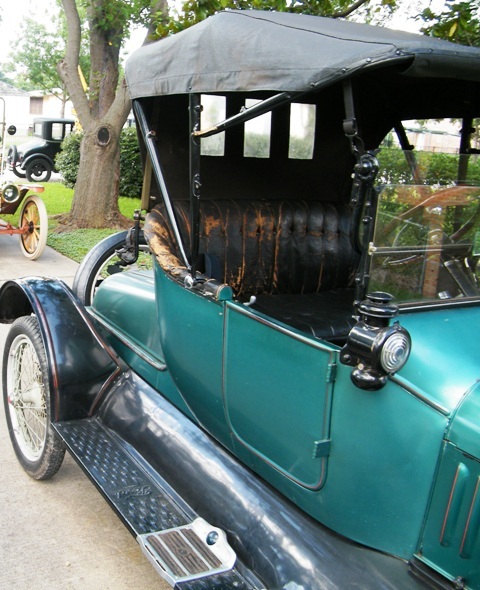 Nice car you have not replace upholstery, nice patina. I think the aprons were more square and different on the center door then the open cars. It seems that the hub caps are not painted on this car and the wishbone is over the axle. 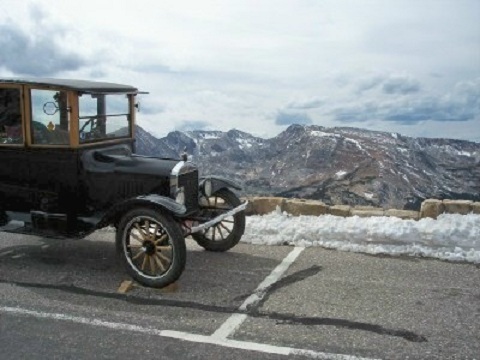 Do we know the paint on the hub caps was only through 1917? We discussed that on another thread and I'm uncertain what the conclusion was. It has the wrong door handles. At least in 19 they are bail handles. They are "bail" handles as are the ones on our '19 - can't say I've ever seen them painted black though. Our splash aprons are the same as any other T of the era - our '25 Tudor had the "squared" aprons. Steve You are right it does have a bail handle. But I have had a 19,29 and 21 and they all had demountable wheels. The one above does not have the demountables. This has been a fun thread. I enjoy the old T pictures. Encyc. 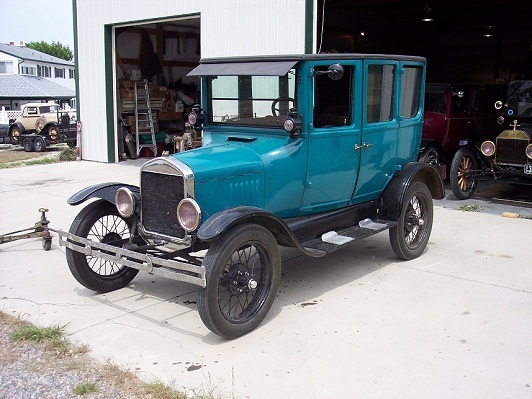 says the 1919 Models began in January 1919 and closed cars had no cowl lights because they were all starter cars. Here's ours Dave - '19 with incorrectly added sidelights as it is a starter equipped model. I don't think the side lights are incorrect because they look great. I have always been going to put them on my 19 but so far have not done it. In fact the entire car looks great. I have put 43,000 miles on mine since I have owned it. Center Doors are really great for long distance trips. I see in some of the old ads that they used to sell locking bail handles but I have never found a pair. I think locking handles would be great at a motel over night or even in a caf� were you can't see them. Thanks Dave - I'm supposedly the 3rd owner of this one - bought new from West Seattle Ford and it does have the locking bail handles ! I also like the looks of the side lamps. By the way, nice enlargement, Art ! 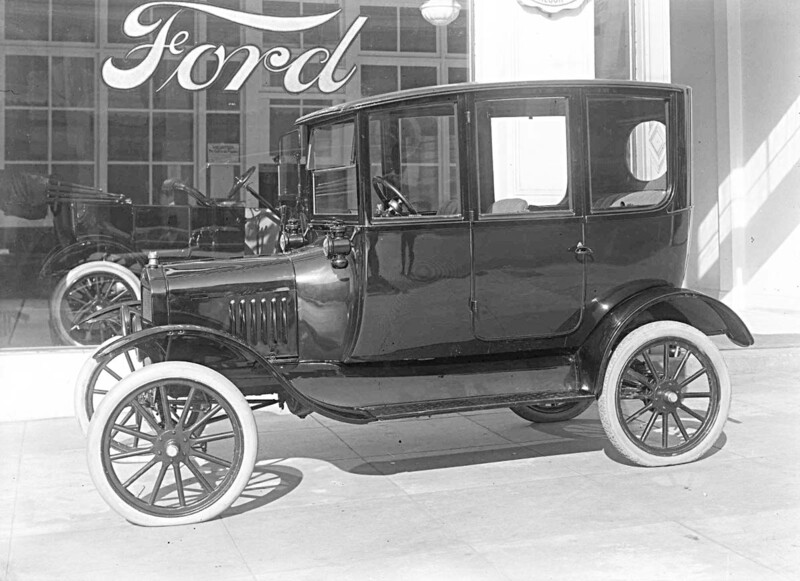 I did this car many years ago its a 25. The fellow that I sold it to had me install side lights and I think they look great. If the nite pickers don't like them they can look some where else. 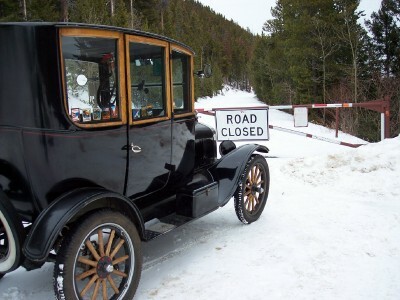 The car is a 1918. Demountables were not available that year. I occasionally come across nickel plated original caps with black background - I wonder what years they were correct for.